their SPF 32 Mineral Sunscreen *, which is made in USA, UVA/UVB Broad Spectrum protection, dermatologist tested, hypoallergenic, free of parabens, octyl methoxycinnamate, & nano-particles, vegan, and PETA Certified Cruelty-free. PLUS it comes with four 2oz bottles of their shampoo & body wash, hair conditioner, lotion and bubble bath. These smaller sizes are perfect for carry-on luggage for all your summer traveling! 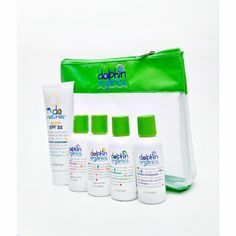 Dolphin Organics are organic and natural, hypoallergenic and tear free! And the Deluxe Travel Set is packaged in a certified Fair Trade mesh pouch. You can purchase Dolphin Organics on Amazon* or directly from their site! Retail Value $34.49! Entry is simple, all you have to do is enter the Rafflecopter below. Open to US only, must be 18+ to enter. Winner is chosen by random.org, all winning entries are verified. This contest will run through June 21, 2014 at 8:59 pm PST (11:59 pm EST). The winner will be chosen the following day and announced on Nanny to Mommy. No purchase necessary. US entries only. Must be 18 years or older to win. The sponsor DID NOT provide me with free samples of these products to review, and I was under no obligation to review them if I so chose. Nor was I under any obligation to write a positive review or sponsor a product giveaway in return for the free product. This promotion is in no way sponsored, endorsed or administered by, or associated with, Facebook. You understand that you are providing your information to this blog and not to Facebook. Please note that Happy Mothering, Easy Green Mom, Brittleby's Corner, the Green Moms Network and the Green Your Mom event bloggers are not responsible for sponsors that do not fulfill their prizes. We have represented each sponsor with the expectation they will fulfill their prize and in a timely manner. We will contact the sponsor regarding your prize(s). The sponsors, in most cases, are shipping their items to you directly. I will make every effort to assist you obtaining your prize. If there is an issue with a sponsor, please notify the blog you won a prize from within 4-6 weeks for assistance, after that we may be unable to assist you. My family is going to the beach this summer. I can't wait! What an awesome giveaway! I am in need of a travel kit for my little guy! Just enjoying the summer with my family! We won't be going anywhere - I have a little homestead to run. I'm home for the summer. Lots of outside time. I'll probably make it to Chicago a couple times this summer (a 2 1/2 hour drive) but other than that it's a staycation summer for me. My daughter has several doctor appts. at the children's hospital 3 hours away that we will be going to. We also have a ton of house projects that we need to work on. But other than that not too much going on. Yes, a week in San Marcos Texas. Conference for hubby and I am taking advantage to get away! we are planning atleast 2 camping trips ones this month and next in july hopefully we can find a decent place since they closed the one we used to go to..
We won't be traveling far, we are expecting another baby soon! Our family is spending a week at a lake cabin. Baby's first vacation! Flying to ND for a wedding and to visit family. This summer my daughter is almost 2 and I'm really excited to do a lot of "firsts" with her! We want to go camping and take lots of day trips to the river and lake. We plan on doing some camping for the July 4th Holiday. We will also go to the lake quite a bit and have cookouts with friends. I love summer! We're headed to Okoboji this 4th of July. Other than that, no big travel plans as we went to Hawaii for 2 weeks this past spring. I do not think we will be going anywhere this summer. We have two great grandbabies on their way soon. I really don't want to miss them!!! We are visiting our family in Florida this summer. I am going on a cruise in July. This set would be great! spending time with my newly born nephew and hopefully a trip to the north west. Spending weekends at the pool with the kids. We'll be camping for a weekend or two but otherwise staying home. mostly hanging at the lake house. mostly just hanging at the lake. We will be camping a week in PA. I'm going to the beach later this summer! Staying at home for the most part. Wish I could say we were going somewhere exotic! We're visiting my parents, who happen to live near the beach. It's going to be awesome! I'm leaving tomorrow to take a trip to Six Flags Great America and visit some sites north of Chicago. Thanks. We're visiting family for a week in July! Each summer we go down to Little Rock, Arkansas to pick up my middle son. We usually travel in the southeast and middle America. We camp and enjoy the road! We are going to go camping and fishing. We don't have any big plans. Just days at the beach and parks, enjoying the sun. We'll be mostly staying home and doing local stuff. For me that means hiking/running on trails near the house. Visiting family. I hope to be traveling this summer! I'd like to go to Northern MI and visit my son! Yes! Visiting family in WV and hopefully traveling to GA to see my brother graduate from basic training. I will prob be taking a few road trips and eating a lot of barbecue. We'll be taking some day trips to the beach and historical sites. I am probably just staying home all summer with the kids. We won't be traveling this summer. We just moved across the country so we'll be busy settling into our new home. We are staying close to home... going to the beach and splash pads. Just a few small camping trips! We are going camping in the Smoky Mountains! This summer we will be going to amusement parks, camping, family reunions, visiting family, lots of traveling! I am working full time and preparing for the birth of my first child in late August/Early Septmber! Let the nesting being! I am not traveling too far this summer other than going to our cabin! We are not traveling this summer, we are renovating our house so any extra time/money goes into our house. With my girls we are just hanging out at home playing in the kiddie pool and going to the park! I hope we'll be taking more road trips, and lots of nature walks! We will probably have a staycation. To Minnesota to visit family. Sadly, I have no plans. I hope to get some day trips to the beach in. Yes, we will be traveling to the Destin, FL area in July! My daughters were in an accident March 6th, my oldest is fully recovered but my 16 year old still have physical therapy to finish (almost done) and speech therapy until school starts in the fall. She also will be working at the school to get caught up since she wasn't able to return to classes due to the traumatic brain injury. It's a lot of running, but considering she was pronounced dead at the scene and God breathed life back into her, I'm thankful to be doing it! Next summer we'll do more fun stuff. We are planing several day trips to the water park and a couple of local sights. We are also planning to visit family in a couple of dfferent states. I plan on using the summer on home improvement projects. We are going to the Cayman Islands this summer. Visiting as many local parks and beaches as we can! Not a whole lot! Going on vacation about a 4-hour drive away later in the summer. We are traveling to West Virginia for a week. Planning to go camping at least once, but hopefully a couple times during the summer. Thanks for the giveaway! We'll be spending time at the lake, and I'll be shopping local farmers markets for produce to make baby food. traveling up to Michigan, and this would be awesome to have for that! We are staying at home, when you're broke you find things outside to do..
We are going to be traveling to the coast for some camping(not sure how excited I am about sleeping on the ground at almost 8 months pregnant) and spending a day in Portland checking out some toddler friendly places. DD and I are also planning on spending some time with parents a few states away. I'm getting ready to go back to school. Staying close to home, just going on a camping trip. Heading to Florida to visit my husband's family, then up to Nova Scotia to visit friends and do some whale watching! As of now we don't have plans sadly, money and a injury to my love's arm hinder that this year. We will have a few camping trips and adventures hopefully !! we are heading to rockport maine in two weeks. We're not doing anything special, really, but I am taking a quick trip to Vegas next month! I'm going to the beach soon. We don't have any travel planned for this summer. Planting new flowers in my flowerbeds. were moving! this would be great during the transition! love dolphin organics!!! No plans for any major travel for the summer, we split our vacation this year, taking a cruise in the spring and one in the fall. We are visiting several state parks to hike. We are going to W. Palm Beach for 3 weeks! Can't wait! We are looking forward to outside time at my moms pool this summer! We plan on camping, going to see the in laws and just enjoying each other! No traveling for us. We are hitting the waterparks tho. I don't have any plans to travel this summer, but I plan on spending plenty of time at the beach and hanging out with my friends! Lots of swimming and maybe a couple short trips up in the mountains. I'm doing absolutely nothing, except school and work! We might do some day trips but have nothing big planned. Hope to just relax and play at home. A few weeks ago I went to Cape Cod with my boyfriend and his family. It was a great trip!! In a few weeks I'll be going with my Mom, my Gramma and my Aunt T to Maine. I'm really looking forward to the trip because we also go with my second cousin Jo and my Great Aunt Bet. Aunt Bet will be 98 years old in August!!! I cherish every summer I get to spend with her and with my Gramma! We went to the beach this summer.